Our chicken-grazing system usually runs like clockwork. Our laying flock lives in our northern chicken coop and grazes in the woods all winter. In the spring, I start rotating them through pastures at around the same time we hatch or buy new chicks. The chicks live in their outdoor brooder in the backyard until they’re about a month old and start scratching up the garden. 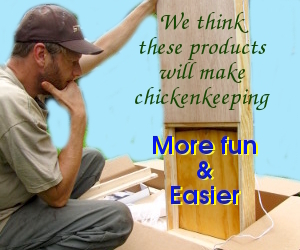 Then they go in the south chicken coop, which is beefed up to be mostly predator-proof. At that time, we start rotating our younger birds through those four pastures, mimicking the path of their parents in the other pasture setup. The trouble is, this year our laying flock simply refused to stay in their pastures. The solution seemed to be to swap them over to the south (chick) coop, where they all settled down and started acting like good hens and ducks. But that left us with nowhere predator-proof to graze our chicks once they grew out of the backyard. (The northern coop isn’t set up to keep out rats, raccoons, and all of the other annoyances that like to eat chickens before they’re fully grown.) After attempting to keep the pullets and cockerels out of the garden with temporary fencing to no avail, we moved them down to the north pasture area anyway…but kept them in their brooder. The technique has worked quite well so far. As a plus, we can get two weeks out of each pasture when chicks are this age since we can start with the brooder at one end of the pasture then move it to the other end the next week. The photo above shows a pasture nearly completely used up at the end of the week. And here the flock is in the next pasture on their list. I’ve let the grass grow taller than I usually do since it was so dry in April and May that I was afraid if I cut the vegetation, it wouldn’t grow back. Hopefully our recent rain and a dose of chicken manure will get new grass growing before the flock comes back around to each pasture again. Move on to the next pasture, boys and girls!